Known as the western-most eastern city, St. Louis represents the gateway to the west. In fact, it is the site of the beginning of the Lewis and Clark Expedition, which set off in 1804. It is also the city that the famous explorers chose to settle in upon their return. With the Gateway Arch towering over the city’s skyline, people traveling through today can see it as a symbol of the past and present. Apart from its central location, this melting pot of a city has the sports teams, the arts centers and the history of a robust epicenter. 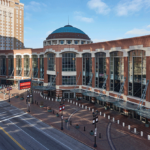 Luckily for meeting-goers, they can experience much of St. Louis’ cultural heritage for free because the city has more free attractions than any city outside of Washington, DC. Among them are the Missouri History Museum, Contemporary Art Museum, Saint Louis Art Museum and Laumeier Sculpture park, to name a few. And if you come during Mardi Gras, you can join in the city’s celebration of its French roots with the second largest Mardi Gras celebration outside of New Orleans. These attractions, along with a central location—it’s within about 500 miles of one-third of the U.S. population and 1,500 miles of 90% of the people in North America—make it difficult to find a reason not to visit.